There is no best nifty option trading strategy; however you need to keep certain points in mind before putting a trade to make it work. Please understand any strategy is the best if it is profitable. Unfortunately you will know if that trade was profitable only when you close it. 1. Keep Stop Loss in your system: I said stop loss in your system not in your mind. You know if you put a frog in a tub of hot water, it will immediately jump out to save its life. But if you put it in a tub of cold water, and boil it slowly the frog will not jump out, and hurt himself. This only means that if you don’t put a stop loss in the system, you will never take the stop loss and you may lose too much money before you even realize. I do not know which broker you trade with, but I am sure every broker offers a stop loss in their system. If you call and trade, you can ask the operator to keep a stop loss in the system as soon as you place the order to trade and it is complete. This way you will make sure your losses are limited. Of course when time comes to take the profits you can cancel the stop loss order and book your profits. In some systems it is done automatically. 2. Or you can hedge your position: I always prefer hedging over the stop loss. Why? Because hedging will keep the trade alive while limiting the losses. In case the markets turn in your favor, you can still book profits. But if the stop loss is hit, you cannot do anything about it. Yes, hedging involves extra transaction, but over a long period of time its more profitable than stop loss. Did you get what I am trying to say here? All I am saying is that limiting your losses is MORE important than taking the profits. If you can limit your losses I assure you will become a better trader. NOTE: If you are willing to learn how to trade options profitably I offer a course to help you learn the best option strategies that are almost always profitable in any situation. You will learn five great conservative strategies to trade options profitably month after month while limiting your losses. Contact me for more info. 1) When the volatility is low, you should buy options. Remember anything less than 15 is considered as less, and anything above 20 is considered high volatility. When the volatility is low, the options are priced low. You can buy and sell them when the volatility increases thus increasing the prices of the options. To know volatility you can visit: http://www.moneycontrol.com/indian-indices/india-vix-36.html. Note: Since the last 1 year or so (May 2013), volatility is on the higher side. It went up to 39.30 on 12-May-2014 when election results were to be declared in a few days. Buying options and selling them at a higher price is now getting very difficult. 2) Exactly the opposite – when the volatility is high, you should sell options and buy them back when the volatility drops thus reducing the price of the options. Selling naked options by the way is a simple way to suicide in your trading career. In other words please do not sell naked options. It is a very dangerous strategy. Note: The problem with the two above written strategies is that it is very difficult to time volatility. Today it might be 16 – and you may want to wait for sometime more so that it falls, but the next day it might be 20 and you may miss the bus. Some experienced traders however trade only volatility and win too. Recently Volatility trading was also introduced by Nifty in the Futures segment. But for average retail traders like you and me, it is very difficult to time the volatility. So what do you do? Ok, let’s look at some more good strategies. Also note that no volatility can supersede Delta and Gamma if you view was right. A 50-60 point swift upwards move in Nifty will increase the price of calls and decrease the price of puts even if volatility decreases or increases up to a certain level and enough time is left for expiry but again you should get your timing right. 3) Buy call options – When you think markets will go up for some time. Let’s assume a stock is at 5600 and is on a breakout on the upside. You can buy ITM calls. Why ITM calls? Because ITM calls move fast with the underlying. If you buy out of the money calls, the underlying has to move significantly for you to gain some points. Remember it’s all about points and nothing else. For the same 100 points move in a stock, the In The Money (ITM) calls will go up more than the Out of The Money (OTM) calls. So your profits will be more. Yes the losses can be more too. But with OTM options you are more likely to lose even if your prediction of the movement was right. Here is an important point to limit your losses. If your view is that a stock will go up 200 points only then why you should play a move that you think may never happen? In that case you should sell the 5800 calls (you have bought the 5600 calls). If Nifty expires below 5800, than you keep the premium paid to you as well as the profits you made on the 5600 calls. Great. Hmm!! So what is the problem with this strategy? The problem is that if your view was right and you do not want to wait till expiry, the profit you make will be less than what you could have made had you bought a naked I(not-hedged) 5600 call. Selling 5800 call will limit your profits beyond 5800. However if your view was wrong you will make a limited income on the calls you sold, and make losses in the calls you bought. Therefore your losses will also be limited. It depends on the loss you are willing to take. You should do this if you feel markets will move in a certain direction for sure. Even if you are right 50% of your time, with this strategy you should make money, because the sold calls will limit your losses. If you did not understand, selling the 5800 call is NOT unlimited loss as you have bought another call of 5600. This is a limited profit strategy as any profits above 5800 will be a loss for the 5800 call that you sold. So your max profit will be capped till the stock reaches 5800. After that there is no point in staying in the market. You should close your position and take your profits even if the expiry is far away. Why? Because you cannot predict what will happen during the expiry. The profitable trade today may be a loss making one when expiry arrives. So do not wait till expiry. If you are thinking how will you make profit because one call will be in profit and another in a loss? The 5800 call will make less loss since it was OTM and the 5600 call will be more profitable since it was ITM/ATM. In the money options move faster than out of the money options. The difference is your profit. And if the market starts to go down, the 5800 call sold will start to generate profits; however your losses will be more in the 5600 call bought. The difference is your loss. Someone who bought a naked (not-hedged) 5600 call would in this case lose more money than you. However his profits also will be more. 4) Similarly if you think the markets will tank, you should buy ITM puts and sell OTM puts. BTW in any strategy you should clearly know your stop-losses and profits that you want to take. If you don’t know in advance it may be that you will lose more than you want, but it’s strange that you will take much less profits than your losses since you will be hurry to take the profits, but wait for very long when your trade is making a loss. Therefore your strategy should be clear on when to take a profit and when to book a loss even before you put the trade. 5) Selling Iron Condors: One of the most popular strategies worldwide – this is a market neutral strategy where you just need to have an idea of where the markets may be trading near expiry or in the near future. If you feel markets are not going to move much in either direction for the next few days – Iron condors are the best strategy during these times. If the markets actually do not go anywhere and stays at around the same level you will make money. Iron condors are nothing but a combination of credit spreads of calls and puts. The call credit spread acts as a hedge for the put credit spreads. For example if you think the current series of Nifty will not go beyond 5900 and will not end below 5600, you can sell 5600 put and 5900 call. However since this is a very risky strategy as you can suffer unlimited losses on either the call or the put if Nifty starts moving beyond those levels you will have to hedge your position. You can buy 6000 call and buy 5500 puts. This way you are insured even if Nifty goes anywhere above 5900 and below 5600. As you can see now you have done a call and a put credit spread. But this strategy will limit your income and the risk-reward ratio is also not good. If you win 3 times and lose 1 time you will barely break even. If you continue doing this for a life time you achieve nothing. Strangely this is the most popular way of trading by most traders all over the world. However this strategy can be very profitable over a long period of time. In short I can only say that you need to adjust if one of your positions gets threatened and have a strict stop loss. The success rate of this strategy is 80%. Condors works best when nifty is stable. If you think for the next few days nifty will be range bound, you can sell a condor. Some people just sell condor and do nothing. These people are looking for less income but more chances of winning. For example if Nifty is at 5800, what about selling 6200 calls and 5400 puts. What are the chances that Nifty will cross 6200 or go below 5400 at the end of the series? So you can see the wider the condor, the greater the chances of winning. But the wider you go the lesser you make. 🙂 Everything has a trade-off ;). Some people sell condors without hedging it (means without buying the calls and puts as protection or insurance. For some strange reason its mostly called insurance in the western countries like the US. In India traders call it protection. I do not know why. It does not matter what people call it – you should buy them – Period. Technically they are insurance as they cannot protect the losses – they can only limit it. 🙂 Unfortunately this is greed and nothing else. Greedy traders rarely make money. They will make very good money for 3-4 months and one bad month will wipe away all their profits. And technically it’s not even a condor. They are actually trading short strangle or short straddle. Both are dangerous strategies. 6) I do trade Futures (Nifty or Stock) but only when I have a strong view. Mostly after a major news is out. As a risk management strategy I consider Futures a very risky derivative. So even if I trade in Futures, I combine them with options. If you trade Futures too here is a piece of advice: If you buy a Future do buy an ATM put and if you short Future do buy ATM call. Yes this will limit your profits, but a sudden whipsaw (when a stock’s price takes a sudden turn in the opposite direction of the trade sometimes as soon as a trader puts a trade), this will severely limit your losses. If an ATM (At The Money) Option is priced at 100 – your maximum loss is 100 points. Note: If you like to trade Nifty Futures, my course also has 2 very conservative directional trades – a beautiful combination of Futures and Options. In that you make money if you are right, but you lose less if you are wrong. If you are badly wrong – a gap opening against your Future – you still make money. Note: Option is a game of math and Option Greeks. It’s the points you make or lose. Whatever strategy you are following you should have a strict target and stop loss. You should do virtual trading for a while before putting your hard earned money on the line. If you have a target in mind, keep it to the number of points and not money. For example if you want to make Rs. 5000.00 and you have bought 10 lots of Nifty. You need only 10 points to meet your target (500*10 = 5000). Exit your position if your target is met. Do not be greedy. Greed, fear and hope are the three emotions that are your worst enemies while trading. If you can get rid of them and get some knowledge you will be a winning trader. 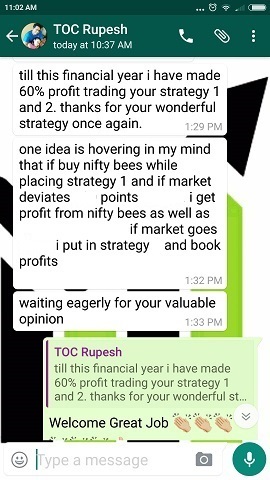 Whenever I write an option strategy I update this page with a link to it: http://www.theoptioncourse.com/free-nifty-option-trading-strategies/. If you think you gain anything by reading the strategies here please do bookmark that page or at least subscribe to my newsletter. Whenever I write a new post you will get an email with link to that article. You can subscribe your email at the bottom of this page. I will be happy to answer any questions that you may have on options trading. Please ask in the comments section below or contact me. I have read couple of your articles. I should say they are impressive. Unfortunately, I have incurred significant losses by working with some tips providers! I am worried about my losses that I may incur by following somebody’s advice. How do I trust that your strategies would work? Sad to know you incurred losses in trading. Initially everyone loses because they speculate, so please do not worry. I agree losing money trading by paying to tips providers is very painful. One they take your money and two they give bad tips. They are best avoided. Its better to educate yourself and trade. 1. Difference between my website and others. If free articles are of high quality the paid strategies must be good. 2. 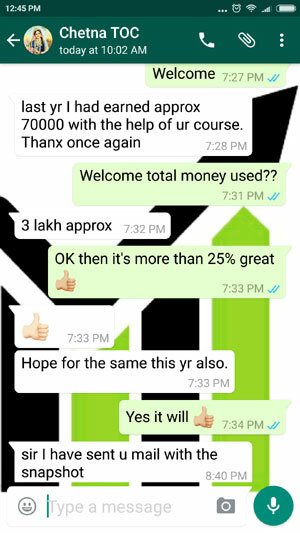 Real Testimonials on real trades by people who took my course. 3. Excellent Support for life through email, whatsapp and phone. 4. Options strategies based on logic of options behavior NOT some magical adjustments. 5. No promise of huge returns – only 2-3% a month which is get able. 6. Simplistic approach to options – not complicated. 7. All trades 100% hedged – so chance of huge loss zero. 8. Loss if at all is limited. Its 1% or less of margin blocked. 9. 80% success rate of the non-directional strategy. 10. Positional trades. No need to sit in front of monitor when the markets are open. Average time of profit booking in a trade is 15 days. 11. A lot to learn in the course apart from the strategies that can help you for life. Some people focus on cost of the course. Winners focus on value. The price of the course is nothing compared to the money you can earn. Take your call. Invest in education that’s the only thing that can give amazing returns. I read your articles regularly. I fact your articles are not less than any sort of paid training available in the market. It gives us new ways of thinking and also such inputs are necessary for successful traders so that they do not loose track. Objective is to help people learn. Just hoping that people read and get better ideas of trading. 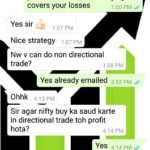 I do not offer Nifty Option tips or any tips on share trading at all. The real reason is that you will become dependent on me and will not learn anything. Leaving your finances in someone else’s hand is not a good idea. You should be master of your money – not anyone else. Therefore its always advisable that you learn trading yourself and manage your own money. I have also written an article on why I do not offer any live tips on trading. Really enjoyed reading the options. Planning to start options tradining. Somashekhar nice to know that you enjoyed reading the post. Keep coming back. I have been making money in options. But I can only trade in vertical spreads as I do not know a broker who can guide me in butterflies and condors where 4 options are involved. Can you suggest a broker who has interest in options? On the other hand there are traders who make lakhs per month trading only Nifty Options. Still they want to learn conservative options trading because they want to divide their risk profile 50% aggressive and 50% conservative which I think is an intelligent way to trade. Risk management is the most important decision in trading. Traders having strong risk management plans in place rarely lose money. Anyways, coming to you. Why do you only trade in vertical spreads? No broker will guide you. Why should they? What if you make a loss? You will then start blaming your broker and stop trading. If you stop trading how will your broker make money? 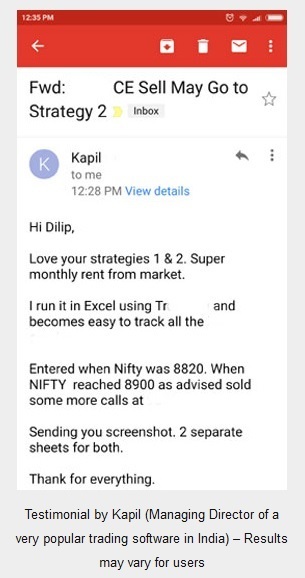 Therefore I rarely see any broker in India offering tips in options trading. They make money from brokerage, whether you make money or not. Therefore my advise is to search a broker who takes the least amount of money per trade (per traded order not per option/future lot traded – it does not matter how many lots of options/futures you sold or bought – if it is one order – they will only charge for that one order). Since in a condor four trades are involved – you will only end up paying for four trades. It does not matter how many total lots of options you bought or sold in those four trades. One such discount broker is ZERODHA. Right now they charge flat Rs. 20/- per trade. RKSV Securities is another. Under their Dream Plan 5 trades are Free per month for LIFE of the customer and after that you end up paying Rs. 20/- per trade regardless of the size of the trade. No monthly commitments in both Zerodha and RKSV Securities. If you want to learn Conservative Option Trading Strategies, I recommend you take my course. I will also give you support after the course till you become very comfortable trading these strategies yourself and do not need my help. I did not understand this para. If you pl explain me more elaborately. Here is an important point to limit your losses. If your view is that Nifty will go up 200 points only then why you should play a move that you think may never happen? In that case you should sell the 5800 calls (you have bought the 5600 calls). If Nifty expires below 5800, than you keep the premium paid to you as well as the profits you made on the 5600 calls. But Anantha let me also tell you that reality is different. If Nifty starts to move up the trader will make money in 5600 call, but lose money in the 5800 call shorted. He will not have any patience to wait till expiry so somewhere down the line he will book his profit. Which means he will take a profit in 5600 call buy, buy lose some money in 5800 call sell. But his profits will be more than his losses, so overall he will be in profit. He will feel bad in taking a loss in 5800 call. But that should not be the case. Why? Because what if Nifty does not move up? In that case he will lose money in the 5600 call but make money in the 5800 call sold. Yes over all he will be in loss when he decides to close the trade, but his overall loss will be MUCH LESS than what he would have taken had he bought the 5600 call without selling the 5800 call. Let me also clarify that this is the real reason why most retail traders lose money trading options. They just buy options looking to double their money in every trade. This seldom happens, and over a long period of time, hope of making a fortune actually kills his trading account. 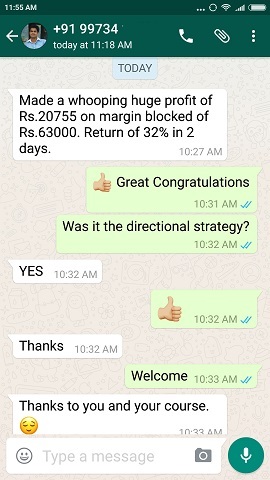 Here is one trader who lost 40 lakhs buying options. 1. It reduces the cost of buying the option – so your maximum loss gets reduced. 2. It helps you to stay in the game longer because your loss is less. Eventually you may get lucky by a Nifty reversal and end up in profit. Do we have Call and PUT in futures? If you buy a Future do buy an ATM put and if you short Future do buy ATM call. Anantha, I did not understand what you meant by “Do we have Call and PUT in futures”. But yes you can trade Futures in every stock or Index approved in the F&O segment by the market makers. Futures however are high leverage and very risky derivative instruments and therefore should be traded with caution. They are more riskier than options. As far as the second question – YES! Since buying or selling Futures both involve unlimited risk, a trader should always buy ATM put if buying a Future and buy ATM call when selling a Future. This way your risk is limited to the premium paid for the option bought. However your profits will be unlimited. 🙂 Why? Because Future can make unlimited profits but the option bought has only a limited loss. My question suppose if nifty is range bound neither futures nor ATM call or put will make money??? Is it right sir. Shubha, if Nifty is range bound (it depends what range you are talking about), then yes neither of them makes money. In fact assuming Nifty is exactly at the same position on expiry, this trade will lose money as the option bought expires worthless. This is the reason why traders do not buy protection. But how many times does that happen? Nifty will move in a 30 day period and almost 200 points move is guaranteed. This is where the bought option helps. If wrong the loses are severely restricted, if right the trader will not take all the points – but still good enough profit. But please understand its the losses that kicks us out of the game and a hedges’ work is to stop exactly that – to limit the losses. Hope its now clear. I am very new to option. Why can’t we trade long box and Short box every time ?? Short Box and Long Box are great arbitrage trades with zero loss and good profits but you will rarely find this opportunity in any stock or Nifty. In fact any kind of options arbitrage is hard to find now a days. Short Box is: When a trader sells ITM options (both calls and puts), and buys OTM options for protection. Long Box (also known simply as Box Spread) is: When a trader buys ITM options (both calls and puts), and buys OTM options to reduce the option buying cost. Short box is done when the combined credit is MORE then the difference between the ITM strikes sold. Long box is done when the combined credit is LESS then the difference between the ITM strikes that a trader plans to buy. As you can see the value of the box will also be 100 on the expiry day, the trader will not gain anything from the trade. In fact his broker will gain since he pays the brokerage for the trades of four legs to open and four to close. Abhishek, hence now it should be clear why can’t we trade Long Box and Short Box every time. The opportunities are few and far and you will be wasting time looking for them. I am looking for a software that generates option strategy payoff diagrams for NSE FNO, stocks & ETFs. Can You pls suggest me one ? As far as I know some brokers like the rksv.in offer it for free for their clients. You can ask your broker as well may be they offer but you do not know. You may get paid software too if you search online. But why do you need it? I do not make a payoff diagram before I start a trade. I have a plan and follow that plan. I know my max loss and max profit – that is it – why do I need a pay off diagram? It does not solve any purpose for me. I am sure you are a banker 🙂 Bankers love these complicated presentations and charts. All those are useless in live trading. Heck I do not even trade on a live streaming stock-rates java platform. Those red and green LEDs confuse me. I trade on web and am happy with my trading and results. What will I do with charts? Hope you get the point. Dilip ji, My Friend My Mentor! I owe you a heart-felt thanks for educating me through your engrossing & wonderful lessons. I have learnt on options from your free course and I keep reading time and again a few of them. In fact, I am trying to sort out a strategy or two for Day trading the Options. Where I feel comfortable and all that. I have gone through (learning) various strategies of various Gurus (Hari Swaminathan also among them). That’s how I chanced upon your course. (Now, do not take it as seeking advise, I am just speaking my mind). I hope to find it in a few more days. BTW, do you know why? I believe that you are a good man indeed. Also i want to know whether your strategies work in recent turmoil also. Out of them 3 are entirely made by me. The other 2 exist, but why it works is because I trade in a very different way than what you read online. For example two people trade butterfly but one of them always make money and the other losses. It is the same strategy that everyone knows, but one loses and the other makes money. So there is no problem with the strategy but the way its traded. In my course you will learn how to trade non-directional in the best possible way and give yourself the best chance to win. You learn when to trade, which strikes to sell, which to buy, when to take profits out and when to take stop loss. There is no hope in the strategy. It is a very disciplined approach that I follow and you learn the same. Non directional can give a small manageable loss if Nifty breaks the range fast and strong which comes like after 3-4 months. However even that we recover from strategy 2. Remember that all options are hedged so losses are very small. The conservative stock option and the directional trades also follow the same approach.